CATACOMBS. From the latin word CATACUMBA, from the Italian word CATACOMBA. 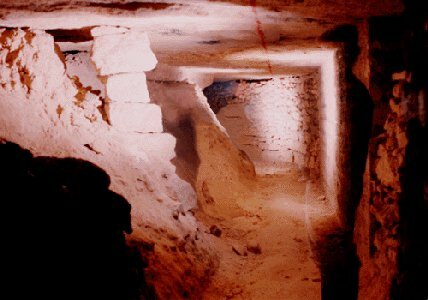 An underground cemetery made up of galleries on the sides of which are openings disguised as tombs. The origins of the word are unknown, but it was probably first used to describe the underground cemetery of the San Sebastino Basilica close to Rome, the reputed temporary resting place of the remains of Saint Peter and Saint Paul in the second half of the 3rd century. Or so the underground cemeteries say. Created at the end of the 18th century, the ossuary at Denfert-Rochereau Place was chosen from among the vast network of galleries that resulted in centuries of underground exploitation of calcareous rock, gypsum, loam, and clay. The kilometer of distance covered is but a small area in the middle of the large 14th arrondissement network of approximately 100 kilometers (in the 14th arrondissement, as well as the northern part of the 15th, the 5th and 6th arrondissements, from the market streets to the Luxembourg Gardens). About another 100 kilometers are spread out between the 13th arrondissement and the southern 15th arrondissement networks, and that of the 16th arrondissement, called the "Chaillot Quarry". All of this is what is often evoked by the term "catacombs". Here, we are mainly going to explore the "nest" of the ossuary at Denfert Place, to learn about the hundreds of kilometers of galleries that are between 10 and 35 meters underground, on one or two superimposed levels, under the drains and metro of Paris.